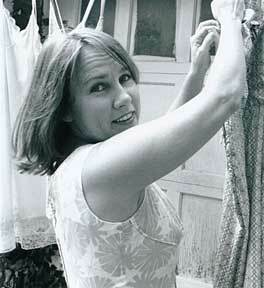 One of the most celebrated country-folk performers of her day, singer/songwriter Iris Dement was born on January 5, 1961, in rural Paragould, AR, the youngest of 14 children. At the age of three, her devoutly religious family moved to California, where she grew up singing gospel music; during her teenaged years, however, she was first exposed to country, folk, and R&B, drawing influence from Loretta Lynn, Johnny Cash, Bob Dylan, and Joni Mitchell. Upon graduating high school, she relocated to Kansas City to attend college. After a series of jobs waitressing and typing, Dement first began composing songs at the age of 25. Honing her skills at open-mic nights, in 1988 she moved to Nashville, where she contacted producer Jim Rooney, who helped her land a record contract. Dement did not make her recording debut until 1992, when her independent label offering, Infamous Angel, won almost universal acclaim thanks to her pure, evocative vocal style and spare, heartfelt songcraft. Despite a complete lack of support from country radio, the record's word-of-mouth praise earned her a deal with Warner Bros., which reissued Infamous Angel in 1993 as well as its follow-up, 1994's stunning My Life. Her third LP, 1996's eclectic The Way I Should, marked a dramatic change not only in its more rock-influenced sound but also in its subject matter; where Dement's prior work was introspective and deeply personal, The Way I Should was fiercely political, tackling topics like sexual abuse, religion, government policy, and Vietnam. In 1999, she collaborated with country man John Prine on his album, In Spite of Ourselves. Dement recorded four duets with Prine that earned her a Grammy nod the following year.